Hello, dear artists and lovers of art. In today’s drawing tutorial we will draw one of the most recognizable characters from russian fairy-tails.How to draw Ded Moroz – is the theme of today’s drawing tutorial. 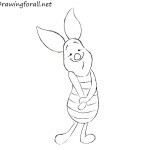 In a lot of our drawing tutorials we drew a lot of characters from different countries – Karlsson-on-the-Roof from Sweden, Winnie the Pooh from Britain, and many others. 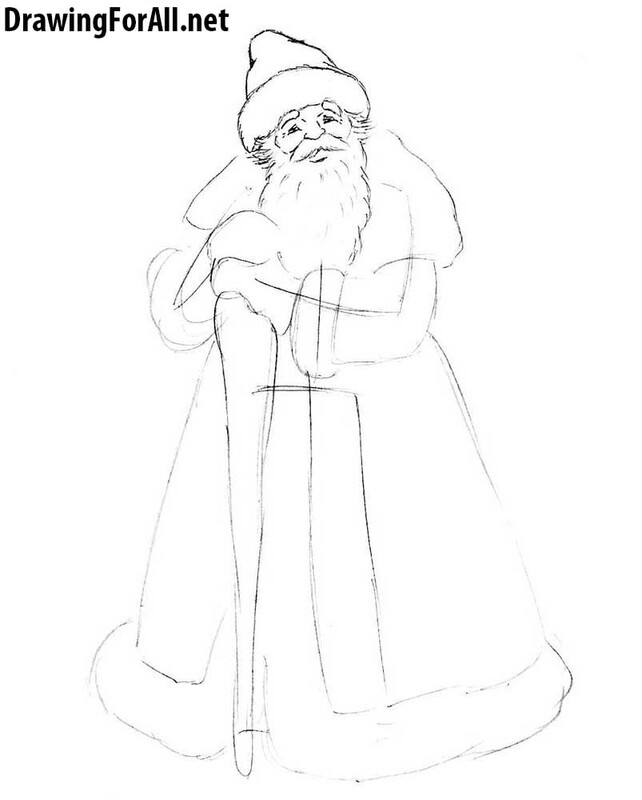 In today’s lesson, as we have said, we will draw Ded Moroz which resembles the American image of Santa Claus. Let’s start with a stickman. 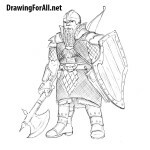 In general, it is possible to apply the rules of drawing the male figure, you can read them in the first stage of a lesson on how to draw a man. 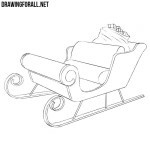 As we said in that lesson, first we draw the head of Ded Moroz, then using simple lines draw the skeleton of the body. Sketch out two lines of the facial symmetry on the face Ded Moroz. At the top of the head sketch out the hat. 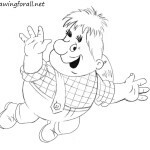 At the bottom of the head draw the outlines of the beard. Focusing on the lines out the arms outline the contours of cape. Also denote silhouettes sleves and mittens. Clothes should not be tight-fitting look, coat of Ded Moroz is very spacious and at the same time warm, dense. The lower part of the coat is very, very spacious, its outline is extended downwards sharply. Do not forget to designate a fairly wide edge at the bottom of the clothing. Here we draw the staff, it has rough, uneven contours. Note also that the staff strongly narrowed downwards. Using the markup lines, draw eyes, nose and mouth of Ded Moroz. Circle the lines of the hat and beard. Be sure to wipe off any auxiliary lines. Do not forget to map out the wrinkles on the edges of the eyes and the contours of the mouth. 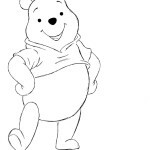 Now Draw eyebrows (they look like commas) add more wrinkles above the eyes and outline the contours of the cheeks. Also in this step we will work on the beard, bearing in mind the important rule – the hair should be drawn in the direction from the roots to the tips. Erase extra guidelines from the sleves and mittens. Outline the fur trim of sleeves (loop must be slightly serrated), in the area of the left elbow outline a couple of folds. We attach a toothed contour of the edging to the bottom of the jacket of the clothing of Ded Moroz. 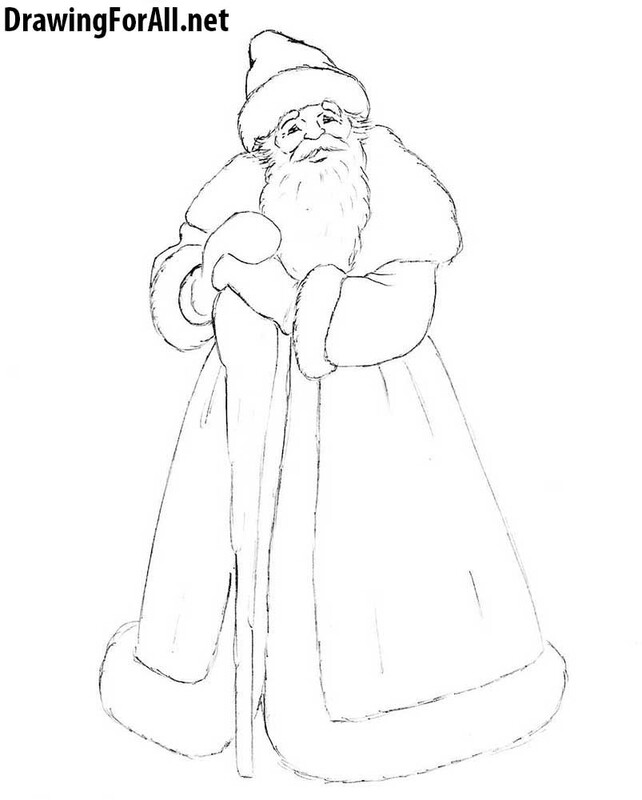 Erase unnecessary lines from the coat of our frost grandfather, and draw the final details to his figure to get beautiful and the completed drawing. We have worked well. Today’s drawing lesson we wrote in October (soon halloween), and will soon be winter, when our grandfather frost come into its own. And if you draw it in the summer, we still wish you a piece of the magic of Christmas warmth, which gives the fireplace with red socks, in contrast with the winter cold. 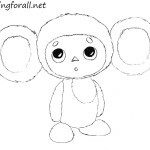 DrawigForAll was with you today in the lesson on how to draw Ded Moroz. Do not forget to look to our page in FaceBook, Pinterest, Google Plus, there are many interesting things!